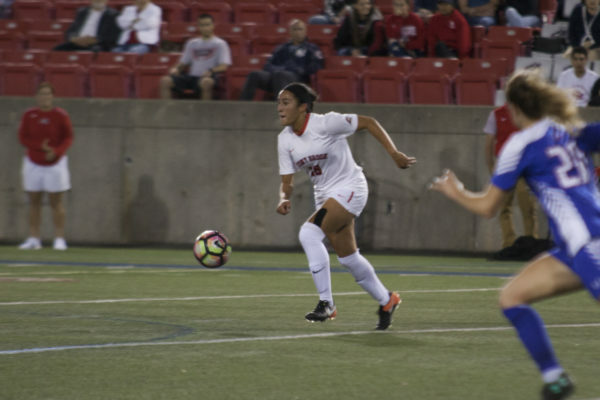 With time winding down on the game clock, and the Stony Brook and New Hampshire women’s soccer teams stuck in a scoreless tie, senior forward Manuela Corcho took matters into her own hands. In front of hundreds of eager fans at Bremner Field in Durham, New Hampshire on Sunday, Oct. 29, Corcho fielded a cross from freshman midfielder Kimmy Chavkin in the 76th minute that one-hopped onto her boot. She chipped a shot over the head of Wildcats senior goalkeeper Mia Neas, and the ball rolled into the net for the game-winning goal. The play sealed the match and New Hampshire’s season as the No. 5-ranked Seawolves upset the No. 1-ranked Wildcats 1-0. The defeat was the Wildcats’ first at home all season. Stony Brook’s offense displayed a strong presence throughout the majority of the match, creating several opportunities around the New Hampshire goal. Stony Brook finished the game with six corner kicks, and New Hampshire with five. Stony Brook maintained possession for the majority of the match despite being outshot three to 11 by New Hampshire. The only shot Stony Brook put on net in the match was Corcho’s goal. In the 20th minute, a corner kick by the Seawolves flew into the box and found its way to the back of the net. The goal was waived off by the officials, who ruled that Stony Brook had committed a foul inside the box. Freshman goalkeeper Sofia Manner recorded her fifth shutout of the season, saving all five shots the Wildcats put on net. Manner stopped a crucial New Hampshire opportunity in the 56th minute. New Hampshire senior forward Brooke Murphy, who is third in goals scored in the America East Conference, took a clear shot at the net, but was denied by Manner’s diving stop. With Sunday’s win, Stony Brook advances to its first America East Conference final since 2013. This also marks the first time in America East Conference history that a No. 5-ranked team has advanced to the final since the conference moved to a six-team playoff format in 2001. Stony Brook takes on No. 6-seeded Vermont on Sunday, Nov. 5 at 1 p.m. at Kenneth P. LaValle Stadium for the America East Championship. Stony Brook is seeking their second championship victory in program history.